Conventional accounts of the Scramble for Africa tend to focus on European diplomacy and acts of African 'resistance'. We rarely find detailed accounts of what it meant to individual Africans to be turned almost overnight into colonial subjects. 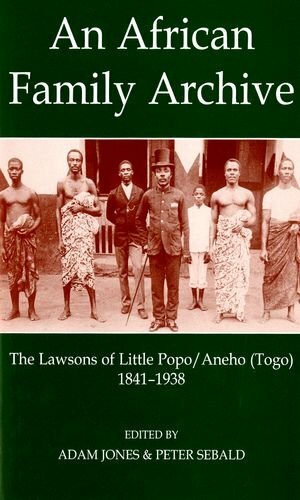 An African Family Archive presents a unique case: a letterbook ('Grand Livre Lolame') written in English by the Lawsons of Aneho, a small town on the coast of Togo. Although the Lawsons were not the only family in Africa to have kept an archive since the mid-nineteenth century, this is probably the first attempt to publish such a source in its entirety. This fascinating collection of over 700 documents allows us to follow the Lawsons week by week through events such as the transition from participation in the Atlantic slave trade to 'legitimate trade' and the efforts of King G. A. Lawson III to prevent Aneho ("Little Popo") and its surroundings from becoming part of a French or German colony. The letterbook remains in the private possession of the Lawson family to this day. Containing documents ranging from the early nineteenth to early twentieth centuries this volume sheds significant light on this period and will be of essential interest to students and researchers of African history. If you have any questions about this product by British Academy, contact us by completing and submitting the form below. If you are looking for a specif part number, please include it with your message.